You're Here: Home / Blog / Digital Signage / Hardware / Interview of Pascal Cübb- the inventor of the ”digiwalkers”-on digital signage trends in Europe. 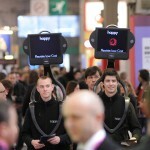 Interview of Pascal Cübb- the inventor of the ”digiwalkers”-on digital signage trends in Europe. Pascal Cübb is the CEO and founder of Cübb, the company that has recently deployed the ”digiwalkers” (the term used by iDOOH Media- one of their partners in the UK ) or the Cyklops as they call it in France for Virgin Radio (read the story here). He kindly offered us an exclusive interview and shared his thoughts on the current issues affecting the Digital Out Of Home (DOOH) market in France and Europe. 1. As stated on your website, the Cübb solution offers both portable HD screens (the Cyklops or the digiwalkers) as well as portable mobile devices- the Cytouch. How do you see the convergence between mobile phones and digital signage? Is the consumer ready for a more interactive outdoor experience? Since its beginnings in 2004, Cübb’s DNA consisted of: Interactivity, Mobility and the Digital applied to the world of outdoor communication (or Digital Out Of Home). Our strap-line is VRM- Very Rich Media (an European brand owned by Cübb) that implies CONVERGENCE. Cübb is one of the European forerunners that is now recognised as a leader due to its unique and innovative concepts. We started with Cyklop (digital screen worn by a man) and quickly added Cytouch (a type of interactive, 3G + tablet) to provide an interactive and mobile digital operation. We’re mixing all these new technologies to offer our advertisers outdoor solutions that can be connected to the web or to mobile media targets. (take the example of Augmented Reality, having contacts to opt-in, taking orders or obtaining information online, providing information via mail, SMS, MMS, QR Codes ….). The increasing demand for such solutions proves that the market is moving towards such applications. The phenomenon of media convergence comprises nowadays the entire realm of digital media with all its supports; while resting on the same golden rule of “delivering the right message to the right population sample at the right time; that of being seen by the right person rather than by everybody or the highest number of people.” Today’s communication campaigns must be very Tactical and Mobile. The new technologies allow it. In recent years Cübb acquired experience in- and mastery of- new technologies through its several international campaigns. And to answer your question, yes, the consumer significantly evolved during the past few years. The evolution of mobile media (tablets, smartphones etc), the emergence of multiple information sources (mainly Internet-based) turned consumers into more intelligent, more informed and less vulnerable targets to the brainwashing of ‘’traditional media’s’’. Finally, technology is not everything and it’s not enough to ensure an efficient communication campaign. “Science without conscience is but ruin of the soul!’’ As seen clearly in many areas, technical revolutions can be harmful and in our business, they can miss their target! We believe in the power of person-to-person communication which is why we added a human element to our solution. We also respect our creed- “CleanTech Media’’ that represents the environmentally- friendly dimension of our company, an essential element in our industry. 2. 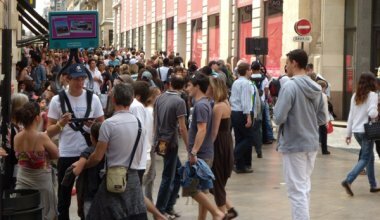 What do you consider to be the greatest threat the DOOH industry is facing at the present in France and in Europe? We have the peculiarity of being Digital, Interactive and Mobile. …at the same time, while focusing on both indoor and outdoor communications. This allows us to be unaffected by the constraints of the new legislation. We also have the opportunity to create “new areas” of expression for outdoor communication, that we call “out of the box”, thus still enjoying the benefits of an outdoor advertising medium that hasn’t been very strictly regulated yet. However, if the new laws will be approved, they will raise a number of constraints especially for our colleagues in the digital display market. 3. Many people believe in the future of the integrated Digital Out Of Home/ digital signage solution (content and technology offered by the same supplier). Do you think it’s a desirable and functional idea? The world of marketing and communications is undergoing a revolution. Nothing will stop the rise of the “new media”, the mutation of traditional agencies is in progress, the emergence of new communication players is real. But all this remains very complex and approximate both in terms of vocabulary, demos and of results. The “outdoor TV’’ topic is a variation of the logical evolution of “Television”. Today, the digital media is far from being confined to computer screens. So it makes sense for the content and technology suppliers to collaborate. However, I do not see the point of putting screens everywhere! “Too much advertising kills advertising” as we say it in France and so “Too many screens kill the screen” … It would not be desirable, and would be ultimately illegal, for one single supplier to detain full market control (despite its integrated DOOH solution). 4. Referring to the ‘’digiwalkers’’ or the Cyklops you are deploying, what are the system’s requirements? What is the concept behind this quite original device? Its only limitation is… the footfall (the number of persons present or passing through a certain area). Cyklop is a suitable support for large cities and as it has been said a few years ago ‘’we should be fishing where the fish are’’. The device’s ability to attract and engage is very strong, this being the mere basis of communication. 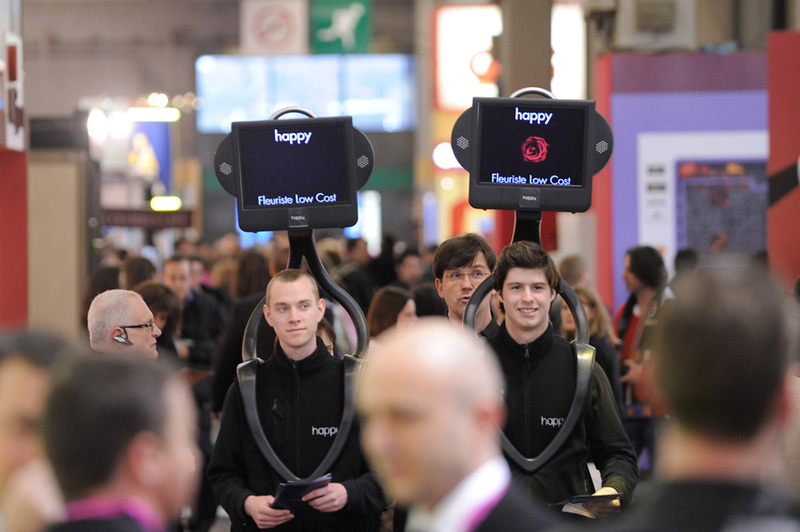 In order to communicate you need to be seen and the ‘’digiwalkers’’ are definitely noticeable. The evolution of technology will help us launch a new generation of Cyklops– lighter, more efficient, less costly to design and more important, with more technical features (but that’s still a secret 😉 ) We’ve got our own patents (issued in Europe and the USA) obtained after years of investment in R & D, Intellectual Property and know-how, setting up partner networks, educating the market, business cases … We are now able to develop the concept further to provide our customers with the ability to deploy the Cyklops at a larger scale (national and international). 5. On your website you mention projects you’ve developed for public institutions (such as the French Terrestrial Army). Can we say that the public sector is re-inventing its communication strategy? Yes, we work with more and more public institutions. The French Army has contracted us for many campaigns this year and many others are to be deployed soon. But there are also other institutions interested in our concept (The Public Senate, La Poste- the mail service in France, The European Internet Foundation etc). They too understood the need to communicate in a modern and innovative manner in order to reach their goals and connect to their audience. That’s exactly what Cübb offers through the use of new, convergent technologies. Cübb® — DOOH specialist since 2004 is the first agency dedicated to the creation and development of exclusive, digital and innovative communication solutions . The Cübb solution includes among others the Cyklops and the Cytouch- two mobile and interactive digital devices deployed both indoors and outdoors. The company has a worldwide presence and collaborates with partners from Africa, Middle East, United States and Canada. This entry was posted in Hardware, Interviews and tagged digital signage by Dynamax. Bookmark the permalink. Hi Mark, I’ve passed your enquiry to Cübb and they will contact you as soon as possible.